Young girls are curious by nature and always hungry for knowledge. Our job is to nurture this by keeping our lessons fun and natural. Once the girls have fallen in love with learning, we keep the momentum going throughout the whole Junior School, from Reception to Year 6. While we have a strong focus on Maths, English, Science and Technology, we also encourage the girls’ creative and expressive side through the performing arts and modern languages. Our highly qualified staff ensure excellent progress and attainment. They provide specialist teaching in Music, PE and other curriculum areas. Academic rigour here is underpinned by our fun and friendly atmosphere, ensuring that our learning environment provides the perfect recipe for success. We know that learning goes beyond the classroom – it happens everywhere and we like the girls to ‘get stuck in’ to a range of activities in an environment that fosters risk-taking, where mistakes and effort are celebrated along with success. We have exciting outdoor areas, on and off site sports facilities and many opportunities to go on inspiring school visits. 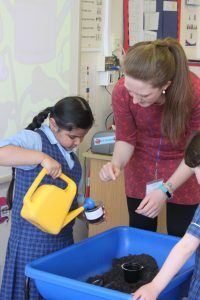 We utilise the skills of our Senior School colleagues too, and their expertise and support helps us to provide a challenging learning experience. In class sizes significantly smaller than state schools our girls develop their independence, collaborative skills and resilience. Our dynamic and innovative approach to teaching has our girls hooked from day one and they have lots of fun, as we believe that a happy girl is a successful girl.